Miami Trace’s Sidney Payton is greeted by Krissy Ison (12) and Jessica Camp after scoring the game-winning run against McClain Friday, April 5, 2019 at Miami Trace High School. 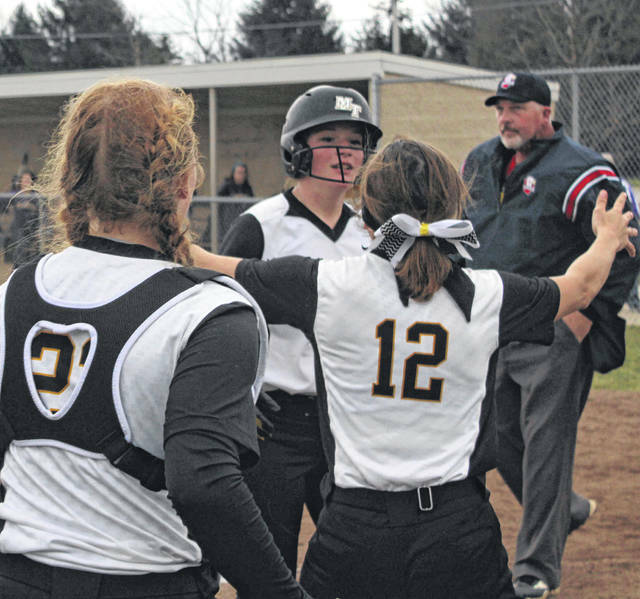 On a cloudy, but mild and relatively calm Friday afternoon, the Miami Trace Lady Panthers hosted the McClain Lady Tigers for a varsity softball game. Miami Trace won the Frontier Athletic Conference contest, 10-0 in six innings. Olivia Wolffe pitched six scoreless innings with no walks, 11 strikeouts and just one hit allowed. Crabtree had the hit for McClain and she was also their pitcher, going 5.1 innings with 13 hits, 10 runs, one strikeout and three walks. Miami Trace took a 9-0 lead into the bottom of the sixth inning. Sidney Payton, who had four hits on the day, led off the inning with a double. With one out, Cassidy Lovett singled, bringing Payton around with the winning run. Kaylee Hauck, Jessica Camp and Ashley Campbell each had two hits for Miami Trace. The Lady Panthers scored one run in the first, two in the third, one in the fourth and five in the fifth. Miami Trace is now 5-0 on the season, 2-0 in the FAC. “It’s going to come. She’s going to get that no-hitter,” Miami Trace head coach Joe Henry said. “She’s throwing the ball well. “The girls are feeding off of her,” Henry said. “We’re starting to hit a little bit better. We hit a lot of balls at them. We’re starting to play as a team. “It’s nice to have that great pitcher who can throw one or two-hitters,” Henry said. “That helps a lot. “Sidney is hitting the ball well,” Henry said. Miami Trace is at London Saturday at 3 p.m. The Lady Panthers play at Hillsboro Monday at 5 p.m.
Offensively for Miami Trace: Kaylee Hauck, 2-4, 1 rbi; Olivia Wolffe, 0-4, 1 rbi; Jessica Camp, 2-4, hbp, 2b; Piper Grooms, 0-0, 2 runs; Ashley Campbell, 2-4, 2b, fc, 2 runs; Sidney Payton, 4-4, 2 runs, 2 2b, 2 rbi; Aubrey Schwartz, 1-4, 2b, 3 rbi, 1 run; Cassidy Lovett, 1-4, bb, 1 rbi; Krissy Ison, 1-3, 2 runs, bb, 2 rbi; Breanna Eick, 0-3, bb. https://www.recordherald.com/wp-content/uploads/sites/27/2019/04/web1_Sidney-Payton-after-scoring-agianst-McClain-4-5-2019.jpgMiami Trace’s Sidney Payton is greeted by Krissy Ison (12) and Jessica Camp after scoring the game-winning run against McClain Friday, April 5, 2019 at Miami Trace High School.